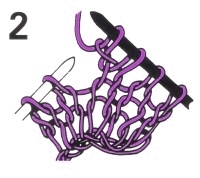 Another basic knitting technique that you will have to learn is increasing stitches. 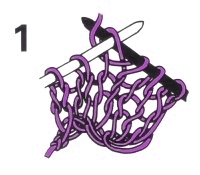 Stitches are increased in knitting by making two or more stitches out of one to increase the total number of stitches on the right hand needle. It is unlikely that you will need to use this technique if you have chosen an easy pattern or one rated for a beginner, but as you begin to tackle intermediate knitting projects like lace and some arans, you will definitely need to know how to do it. Push the right needle through the front of the next needle on the left hand needle. Wrap the yarn under, around and over the right needle and draw the yarn through the stitch on the left hand needle. Instead of slipping the stitch off the left hand needle, push the right hand needle through the back of the stitch. Wrap the yarn under, around and over the right needle and draw the yarn through the stitch on the left hand needle. Slip the stitch off the left hand needle to finish the increase. For a printable PDF copy of the Tutorial on how to do Increase Stitches, just click on this link. Would you like to actually see how to increase stitches?